The Ford F-Series set a new record in November with its ninth consecutive month of 70,000 trucks delivered, but Ford Motor Company was down 6.9 percent year-over-year at 196,303 vehicles sold. The F-Series continues to be a big earner for Ford with average transaction prices hovering around $47,000 per truck, which is $1,800 higher than the segment average. Despite that high mix, Ford-brand truck sales were down 2.3 percent overall and Ford-brand SUVs were down 6.8 percent. There was no shortage of highlights, however, with the EcoSport continuing its strong debut year with 5,893 vehicles delivered and the Expedition increasing sales 7.9 percent at 4,264 vehicles delivered. Ford continues to track toward a record year for SUV sales with 726,495 delivered through November, up 0.8 percent from 2017. 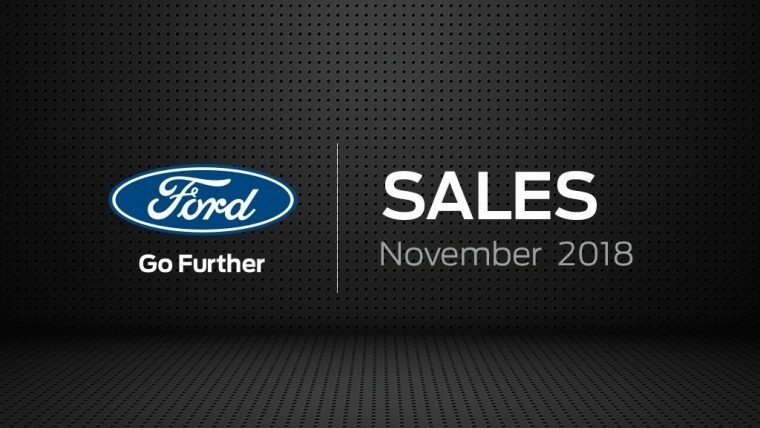 Ford truck sales are up 2 percent through November at 1,032,480 delivered — the Transit is up 10 percent at 126,446 sold, and the F-Series is up 1.8 percent at 821,558 sold. Despite an overall downturn in car sales, a strong November performance — 5,238 sold, up 72.6 percent — has the Ford Fiesta poised to finish the year up from 2017. Through 11 months, Fiesta sales are up 11.3 percent at 47,421 delivered. With one month to go in 2018, Ford Motor Company sales are down 2.9 percent at 2,276,544 vehicles delivered, and Ford brand sales are down 2.7 percent at 2,184,483 vehicles delivered.